As exciting as it can be to find money on the ground in front of you, what can be lost in this moment of elation is understanding whose money it once was, and what it could have been needed for. 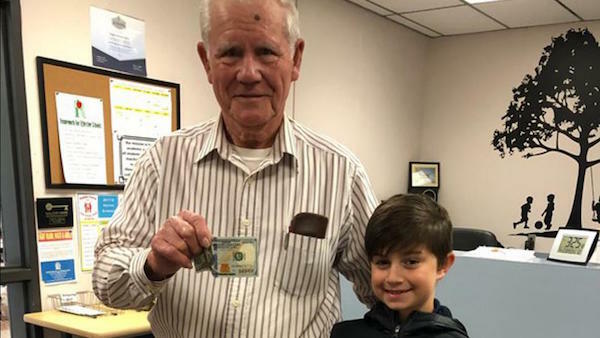 Recently in Louisiana, an eight-year-old boy named Jaron Johnson found a $100 bill in a Walmart parking lot. “He was a few steps behind me and said, ‘Mom, look what I have in my pocket,’ and he said, ‘Can we turn it in to Walmart and give it to the rightful owner?’” Recalled Jaron’s mother, Jodie, in an interview with Inside Edition. Concerned doing that could result in the money not reaching its rightful owner, Jodie instead decided that she and Jaron would take the night to figure out the best approach. The next day, Jaron asked his mother to call the Walmart and ask if anyone had reported losing $100. Jodie did so, but opted to not fully disclose what the missing property was. However, she did leave her phone number, just in case. Hours later, Jodie received a call from the daughter of 86-year-old James Grice. She explained that her father, who is on a fixed income, lost the money while shopping and was unfortunately unable to purchase groceries. Shortly thereafter, Jaron met James and returned the money to him. As a reward for his kindheartedness, James gave Jaron $20 – plus unlimited access to his garden’s fresh tomatoes. This entry was posted in Articles and tagged Act of Kindess, Fixed Income, Happiness, Joy Factor, Walmart. Bookmark the permalink.